MVP debates across all sports tend to devolve into tiresome semantics. What does "most valuable" mean? Is it the best player? The player most valuable to his team? The best player on the best team? The player you'd most like to build a franchise around? From my admittedly biased perspective, I think a stat like win probability added is ideally suited for determining a season MVP. It is a narrative stat for what is a narrative award. It explicitly rewards clutch play and ignores garbage time contributions. Last December, I showed how Steph Curry's win probability added pace was well ahead of any recent precedent. Since that time, Steph's pace moderated somewhat until the All Star Break. Then, in a ridiculous late February spurt, he racked up +205% in win probability added in three games played over four days, culminating in a +100% WPA performance against the Oklahoma City Thunder. This shot alone was worth +40% in win probability added. 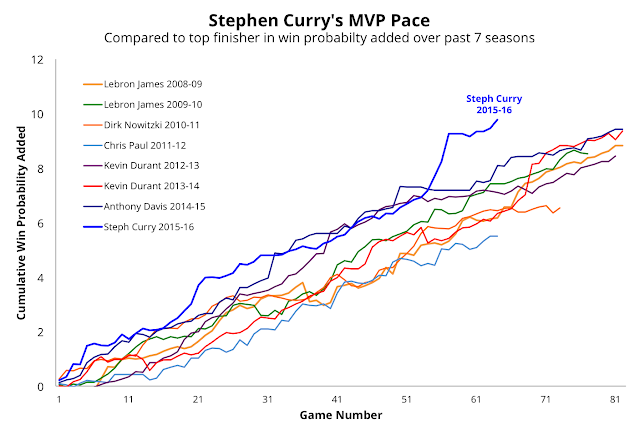 Through 64 games, Curry's win probability added total already exceeds the top full season performances over the past seven seasons. So yes, you could argue that Curry should get the MVP even if he didn't play another game this season. At this point last season, his win probability added total was +5.75, well below this season's pace, but still good enough for the 2014-15 season MVP. As I pointed out in my previous post, win probability added is not a complete metric, so make of it what you will. It only counts made and missed shots, free throw attempts, made and missed free throws, and turnovers. It excludes rebounds, assists, blocks, and steals. For a win probability stat that includes those metrics, there is "kitchen sink" win probability added ("kWPA" on the win probability added table). Under that definition, Curry is number three behind James Harden and Russell Westbrook. But that is largely due to assists, which are counted just the same as if the player made the shot himself. If you instead argued that a player only deserves, say, 50% credit for an assist, Curry once again becomes the leader.